For most companies, healthcare is both a top expense and an important investment in employees. To better control that investment and provide competitive benefits, both large and mid-size employers are considering a transition to self-funded healthcare. Making any changes to your benefits strategy requires careful consideration. Here, we review the most frequently asked questions employers have about a transition to self-funding, from financial risk to employee impact. What are the differences between fully-insured and self-funded health plans? The key difference between the two approaches is how companies fund healthcare claims incurred by employees. A fully-insured health plan requires employers to pay a pre-determined premium to an insurance carrier to cover these claims, even if the claims amount is less than the premium. In contrast, self-funded employers pay for healthcare claims as enrollees incur them with no set premium. Because claims spend is variable in self-funded plans, employers have more incentive and opportunity to control this cost. Learn more about self-funded plan structure and advantages in a printable guide. A common misconception about self-funding is that the benefits are only reserved for large, enterprise employers. While over 80% of large employers are self-funded, midmarket employers can also benefit. Healthgram companies range from workforces of 150 to over 10,000 employees. How could my company benefit from self-funding? Self-funding gives employers more control over healthcare costs. Instead of overpaying on a fixed premium, employers can proactively manage claims cost with tailored clinical or wellness programs and guiding employees towards fair-price providers. Employers can choose providers, become part of a proprietary network and generally put their employees in a position to make smarter consumer choices. Self-funding also has direct cost benefits. Health plan administration costs are significantly lower—typically between 3 to 5 percent—than those associated with a fully insured plan, which the International Foundation of Employee Benefit Plans (IFEBP) reports can range from 15 to 20 percent. Self-funded companies also can avoid state premium taxes—typically 1.5 to 3.5 percent, depending on the state—and costly mandates on insurers’ plans, which can add between 5 to 7 percent to plan costs. Which vendors will I need? Self-funded employers partner with a third party administrator (TPA) or benefits administrator to pay claims, coordinate stop-loss coverage, create customized plan designs, help employees find the right care, maintain enrollment records, negotiate discounts and find savings opportunities. When evaluating TPA partners, look for complete transparency, one integrated delivery system, the ability to adapt to your businesses’ evolving needs and alignment with your goals. An increasing cost for employers is pharmacy spend. Self-funded employers work with pharmacy benefit managers to negotiate discounts and maximize treatment outcomes. They may integrate with your health plan administrator. To keep employees well and ensure they are getting the right care, additional vendors may be required. Consider case management, which supports employees facing long-term health issues, disease management for those with chronic conditions and wellness programs to keep everyone healthy. Healthgram’s approach offers employers an integrated solution. Instead of coordinating with multiple vendors, Healthgram companies streamline all of these programs on one platform. Without a fixed premium, how will we protect against large claims? In a self-funded model, employers purchase stop-loss insurance to protect against the financial risk of catastrophic claims. This coverage reimburses the employer when claims exceed pre-determined individual or group-level thresholds. Specific coverage insures individual claims, while aggregate coverage insures group claims. What does a successful self-funded plan look like? A key advantage of self-funded plans is that strategies are tailored to each individual workforce instead of funneled through a one-size-fits-all model. While individual strategies vary, successful self-funded plans use workforce data to inform plan design, network selection and clinical outreach programs. For example, if a significant amount of your healthcare spend is dedicated to treating diabetes complications, unnecessary emergency room visits or out-of-network specialists, self-funded employers (together with their advisors and vendors) can implement a population management plan that directly impacts claims cost. Successful self-funded plans also see a decrease in medical spend over time. A detailed approach to claims management from your chosen TPA and programs that help employees find fair-price providers drastically improves an employer’s ability to control claims cost. How will a transition impact my employees? While any changes to plan design or networks can affect employees, it’s likely they won’t notice any changes or disruptions in a transition to a self-funded approach. When it comes to paying claims, self-funding works very similarly to traditional insurance, simply requiring doctors and providers to send claims to a different address than before. Take the next steps in adopting a self-funded approach. Download our printable guide for best practices, vendor evaluation tips and what to expect during the transition process. 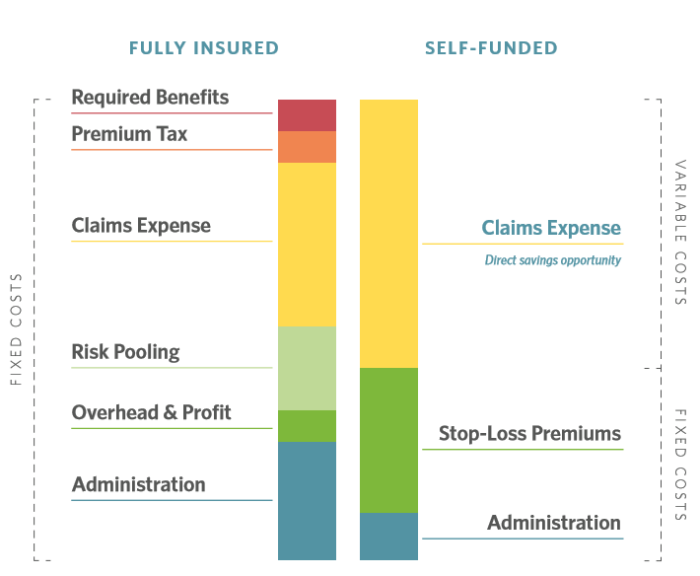 Self-funded health plans can offer greater flexibility, control and cost-saving opportunities. We explain why more employers are making the shift.